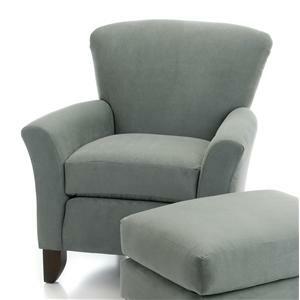 Introduce this stylish pair to your living room or den and enjoy a truly relaxing experience. 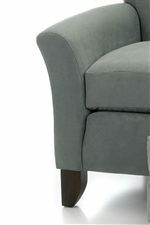 With flared, tapered arms and legs, this chair and ottoman set creates a contemporary look and feel to your home's decor. The wide back of the chair offers comfort and support while the ottoman is perfect for you to rest tired feet or even to be used as an extra seat for family and friends. Furnish your home with this set and sit back and relax. The 919 Upholstered Chair & Ottoman w/ Tapered Legs by Smith Brothers at Wayside Furniture in the Akron, Cleveland, Canton, Medina, Youngstown, Ohio area. Product availability may vary. Contact us for the most current availability on this product. 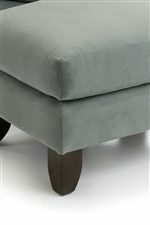 919-30 Upholstered Chair 1 35" 38" 38"
919-40 Ottoman 1 27" 20" 18"